MISH LOVIN' LIFE: Can Great Danes Be Lap Dogs? The answer is yes, yes they can. All 190 pounds of them. Meet Otis, the sweetest great dane in all of the lands. Who also happens to think he's a 10 pound terrier. In other news, this is happening today. Think I got a handle on that whole "Business Casual" debacle? I'm off to go drop my resume off at an office near Fisherman's Wharf. Aw, cute dog! Lovin the business casual look! Great choice! Good luck today! HAh that dog is so cute and good luck! good luck! great danes actually make great apartment dogs. except they take up your whole couch. You look beautiful! I hope it went well!! Good luck! You look great. 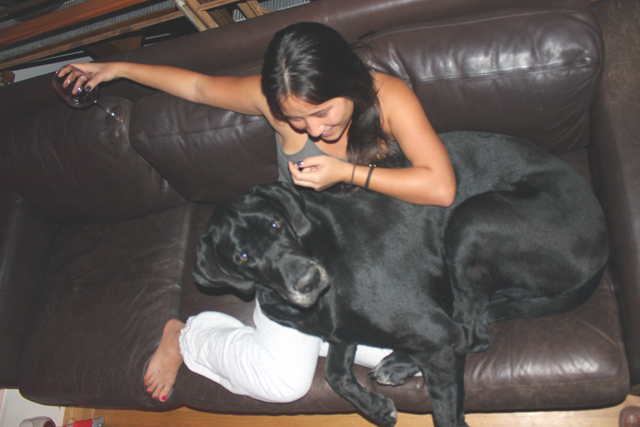 And my favorite is when our dog snuggles, over sized lap dogs are the best! Dark shoes, black, are better as you not only have a black (could be navy) skirt but have dark hair. A style colour thing my friend tells me. Hoping today went well for you dear! And Fisherman's Wharf is such a cool area. I need to move to San Fran. I've wanted a great dane for the past three years. Could be due to the fact that I live in a land where dogs are as small as guinea pigs... but I'm ready for a big dog. a REAL big dog. My students look at me like i'm crazy when I tell them. I LOVE your outfit! So professional but not overly. I think this is a great definition of 'business casual.' 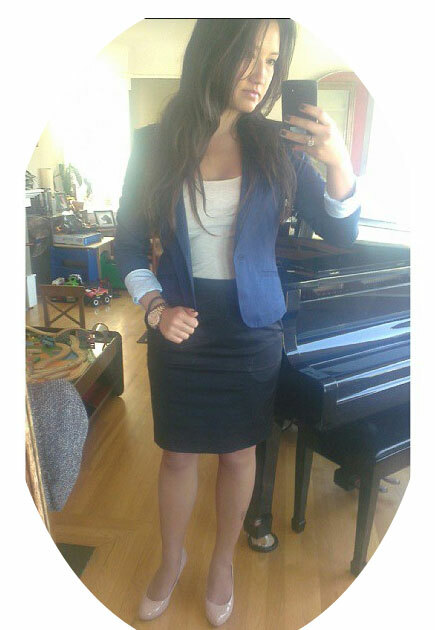 I had to wear this dress code for a year at one of my old jobs...and pencil skirts and heels were my staple! Oh man! My regal black lab thinks he's a lap dog too! It kills me! Love the outfit! You look great! And Otis is too cute. I want to love him.